Donald Trump's official recognition of Jerusalem as the capital of Israel is an embarrassment. A salutary embarrassment. It’s a clumsy, all-too-obvious unmasking of decades of bipartisan U.S. policy whose contempt for Palestinians has been cloaked with a smile and a handshake. As such, it's an embarrassment for the Zionist political and media elite that prefers to operate behind smiles and handshakes, and not flaunt their power. It's an embarrassment to liberal Zionists and “peace process” promoters everywhere—in the American political parties and media, in European conservative and social democrat governments, and in Jewish Zionist organizations. For fifty years, they have laser-focused attention on the post-’67 “occupation,” and done all that they can [nothing concrete], in solidarity with the Israeli Jewish peace movement [dwindling to insignificance in an increasingly fascistic political culture], to end the occupation [minimize its cost to the Jewish state, ‘cause “no concessions, no withdrawals, no Palestinian state” is already proclaimed Israeli policy]. 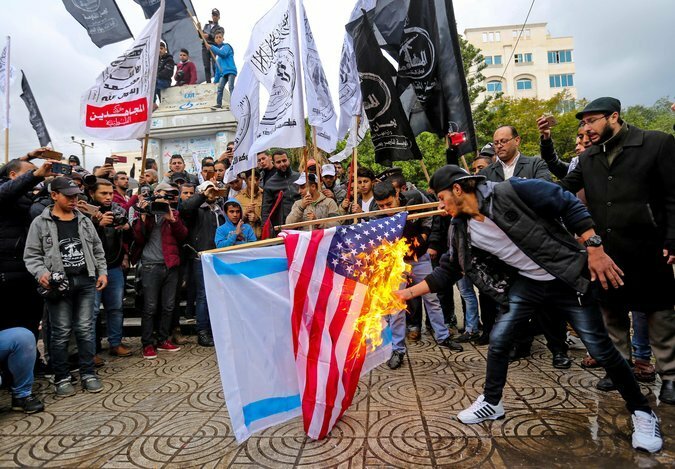 It's an embarrassment to the Arab monarchs and the Palestinian Authority functionaries, who for decades have collaborated in the task of subduing Palestinian rage as Israel went about its colonizing project, holding out the promise that the good American Daddy and his kinder, gentler Israeli Jewish progeny would one day reward the Palestinians for their good behavior. It’s an embarrassment to those liberals who want to portray Donald Trump as a uniquely evil interloper imposed on American politics by a foreign power, rather than understand him as the product of an American political culture that they helped to create while obtusely refusing to recognize what they were doing. The only parties who are not embarrassed are the “hard”—that is, intellectually honest and consistent—Zionists in Israel and the United States (many liberal Democrats included) and Donald Trump himself, who is immune to embarrassment. All this embarrassment provides a fine example of the positive repercussions of the “Trump-effect” that I discussed in a previous essay, which is steadily eroding the thin remaining patina of America's "soft power" in the world, an essential support of the Euro-American imperialist alliance. After all, Israel’s relentless Judaization of East Jerusalem, consistent with its long-held declaration of sovereignty over the entire city, was proceeding swimmingly, with only the feeblest occasional murmurs of protest, accompanied by massive countervailing deliveries of arms and money, from the peace-process-loving governments of Europe and America. Trump's gratuitous, self-aggrandizing gesture, by unmasking that as the de facto acceptance of annexation that it is, only brings unwanted attention to the whole rotten game, and to the hypocrisy of those governments especially. In other words, Trump has suddenly and single-handedly destroyed American’s pose as the “honest broker” in the Middle East and the Solomonic arbiter of world affairs in general, in a way that forces the European and Palestinian political leaders to make an explicit break from what is now declared American policy. For now, of course, that break is rhetorical, but should it remain so—if European and Palestinian leaders do not work a political strategy independent of, and in opposition to, the United States—there will be no denying their capitulation and servility. Indeed, Europe, in the person of the German Foreign Minister Sigmar Gabriel, has already laid down the markers for itself: "Germany can no longer simply react to U.S. policy but must establish its own position...even after Trump leaves the White House, relations with the U.S. will never be the same." Even after Trump leaves the White House. This is a recognition that the American regime—not just Trump, but precisely what he is the culmination of—is not a trustworthy and reliable partner for the management of global capitalist stability. This is what Trump is wreaking. And it’s a very good thing. As excessive and gratuitous as Trump’s Jerusalem announcement was, there is no question that it is the culmination of American politics. It is the perfect example of how Trump is the symptom not the cause of long-festering political rot, the product not the antithesis of American political culture. His recognition of Jerusalem as the capital of Israel is the fulfillment, exactly as Trump says, of a promise that’s been de rigueur for presidential candidates, and of the demand of a law (Jerusalem Embassy Act of 1995) passed twenty-two years ago by overwhelming majorities in both Houses of Congress. Just six months ago, the Senate—including Chuck Schumer, Dianne Feinstein, Kamala Harris, and Bernie Sanders—voted 90-0 to demand that Trump “abide by its provisions.” Schumer, who believes he’s on a mission from God to be the guardian of Israel, had last week criticized Trump for his “indecisiveness” about declaring Jerusalem the “undivided capital of Israel” and moving the embassy. Who can forget the scene at the 2012 Democratic Convention, when an amendment to the platform declaring Jerusalem the Israeli capital was adopted against the clear opposition of the majority? That was shoved down the party’s throat by Obama, who had it shoved down his throat by AIPAC. (It was language Obama had removed from the platform, which AIPAC browbeat him into restoring.) As I discussed in a post at the time, the blithely ignored floor vote was a display of Stalinist party discipline for which Obama was congratulated by an MSNBC roundtable including O’Donnell, Maddow, and Sharpton. So, whatever the problem is with declaring Jerusalem the capital of Israel, it’s not Trump’s. It’s America’s. It’s a problem the Democrats share responsibility for, and will not get us out of. Let’s name it clearly: It’s America’s problem with Zionism. After the “You must accept the Jewish State” insult and the “You must accept Jerusalem as capital of the Jewish State” insult, can we dispense with the diversions? Can we recognize that the problem isn’t how many settlers are in which part of which city, or how long and where exactly the wall should be located, or the Green Line or the Blue Line, or, indeed, the “occupation”? Let’s, without any more fear or hesitation, name and critique the fundamental problem: Zionism. Zionism is a colonialist project. Israel is a colonial-settler state. The fault lies in colonialism—you know, that thing where a group of people, who want the land somebody else is living on, take it. By subjugating, expelling, and/or exterminating the indigenous population. That’s what has to be named and opposed. Every other problem in the context is a derivative of that. Zionism has the particular distinction of being the last major initiation of a blatant settler-colonial project. It was possible at the end of WWII (1945-8) because racism and ethno-supremacist colonialism were still integral parts of the Western worldview. The great world powers could still blithely dismiss the lives, land, and humanity of an Arab population as dispensable—secondary both to the aspirations of the largely European Jews who formed the Zionist vanguard and to the guilty consciences of European gentiles. It was compensatory colonialism, with the compensation paid by an expendable third(world) people. In the post-WWII, post-holocaust context, Zionism had the further peculiar distinction of being able to conjure about itself an aura of virtue that effectively occluded the blatant injustice of the colonialism it is. Thanks to the consistent and intensive Zionist influence on Euro-American political, media, and cultural institutions, that aura has enshrouded Zionism for Westerners’ eyes for 69 years, long past colonialism’s sell-by date. That aura of virtue is what makes breaking up with Zionism so hard to do, for so many, to this day. I’ve discussed more of the history and arguments about this in a previous essay. At this point, there is so much information available from so many channels, including Israeli scholars, that supporters of Israel who are intellectually honest have a hard time denying that the Zionist conquest of Palestine was colonialist ethnic cleansing, and Israel a colonial state. Liberal Americans know very well that, if such a project were to be proposed today, they would denounce and reject it—no ifs, ands or buts. Today, any person of a modern, secular, liberal cast of mind recognizes the abolition and rejection of colonialism as one of history’s irrefutably progressive milestones, and would see any attempt at colonial conquest as an unacceptable historical crime. “Attempt” is an important word here. Zionists want to think all the nasty work of ethnic cleansing is in the ancient (1948) or at worst early-modern (1967 when liberal Zionists grudgingly acknowledge, colonial aggression was certainly past its sell-by date) past. They present Israel, whatever its nasty origins, as a finished historical product: a liberal democracy filled with juice bars and tech startups—which would be stable and progressive, if only the fanatical Arabs/Muslims would leave it alone. Indeed, a favorite Zionist argument I’ve heard delivered as if it’s a killing rhetorical blow packed with irrefutable historical realism is some version of: “So what, you’re a colonizer, too. American Indians!” Gotcha! Being historically realist and all, we have to recognize that, tragically, over those four centuries, the Native American population was so completely ravaged that it now constitutes less than 1% of the population. If Native Americans were now the majority of the population in North America under white settler control; if they were engaged in a fierce resistance struggle to prevent being expelled or exterminated; if they had the support of hundreds of millions of their neighbors, as well as of populations and governments throughout the world, as well as of an established international ideological and legal framework that forbade and denounced the colonial project the white settlers were still trying to complete (while demanding that everyone recognize America as the White Man's State)—then you would have a relevant analogy. Israel is profoundly insecure. Not because of any external military threat, but because of the presence of the Palestinians. Their defiant presence is an intrinsic threat to the Zionist project. External threats—whether ideological or economic or military, whether from specific countries or from the international community—derive from the presence of the Palestinians and what that implies about the legitimacy of the Zionist project in an anti-colonial, anti-apartheid world. Indeed, the famous loaded question “Does Israel have a right to exist?” is posed by Zionists so insistently precisely because it is an unsettled question about the future. It’s not only about past events—whether Zionists back in the day had the right to establish the colonial entity they did, but also about a present, aspirational practice—whether they now have the right to establish the colonial entity they would like to. The question, really—and those hard-core, “finish ‘48” Zionists know it—is: Will Israel exist? The question is also asking us: “Do you agree that it is right for Zionists to be establishing a colonial-settler Jewish State, ethnic cleansing and all?” Are you going to sign on for that? Israel will only be finished and stable if it achieves that. One can argue that it’s almost there or that it’s a long way off, but done it ain’t. That’s why we should take the opportunity that Trump’s latest embarrassment of American policy gives us to exit for good the phony two-state peace-process paradigm, to forthrightly name and reject Zionism and the colonialism it is. We need to go back to the future, to a proposal for a single, if bi-national, secular democratic state, a de-colonized polity in the territory of historic Palestine, where Arabs and Jews can live in peace and equality. Something along the lines of the “secular, democratic state” the PLO called for in 1968 and the “full secular democracy” that Edward Said championed again in 1999. On the one hand, the exhaustion of the peace process and the Palestinian Authority is now a done deal, as I hope everyone now recognizes. At least as important, the de-legitimization of Zionism is already well-advanced. Politically and ideologically, the actions and discourse of Israel and its partisans themselves do as much as anything to discredit Zionism. And, despite its being kept in the cultural shadows, more Americans are aware of the problems with the dominant Zionist narrative. The BDS movement is strong and growing. On American campuses today, Zionism is losing the all-important ideological battle, especially in the crucial constituency of young Jewish-Americans, and the effects of that are radiating throughout the culture. The reality of this effect is demonstrated by the increased anxiety among the guardians of Zionism, with their increasing efforts to censor and suppress criticism of Israel, to define anti-Zionism as anti-Semitism, and to outlaw anti-Zionism and the BDS movement. The arc of history is not bending toward Zionist colonialism. To wax ironic, Zionism’s fatal weakness may be the effect of its greatest strength—its tenacious entwinement in our political culture, which is hard to overstate. We live in a country where powerful politicians and the wealthy donors who control them proclaim their fealty to Israel; where Israeli officials enjoy veto power over candidates for office down to the level of State Assembly. where the Secretary of State gives a “devoutly Zionist” speech and is still criticized for not being obsequious enough to Israel, where the Vice-President declares “I am a Zionist,” and where a President who was excoriated for avoiding service in the American army can say “I would personally grab a rifle, get in a ditch, and fight and die” for Israel, and nobody bats an eyelash. Perhaps most vomit-inducing in the present context, it’s a country where the Congress has just overwhelmingly passed a bill de-funding the Palestinian Authority (except, at Israeli insistence, the PA security forces) if they give any support to any family member of a Palestinian convicted of what Israel calls “terrorism” (and others would call anti-colonial resistance), and at the same time that Congress allows the great charitable organization, The Friends of the Israeli Defense Forces (IDF), to collect $50 million a night, tax-free to itself and tax-deductible to its donors. All that money is needed, over and above the $3.7+ billion the U.S. gives Israel every year, in order to provide extra-comfortable “well-being facilities” for the beleaguered Israeli “coed infantry units” who have the tough job of dragging Palestinian families from their homes and blowing them up—those families the PA is now forbidden to support. Friends of the IDF galas are hosted in New York by Republican billionaire Sheldon Adelson, and in Los Angeles by Democratic billionaire Haim Saban, and entertained by celebrities like Seal and Israeli-born KISS-er, Gene Simmons (Chaim Witz). Bi-partisanship rocks. America has become a Zionist country. And it shows. And it’s discomfiting. For the most powerful people and institutions in the United States, Zionism has become a core component of American ideology and politics, married, like nothing else is, to capitalism and imperialism as a co-equal existential imperative. It’s a peculiar relationship because capitalism and imperialism do not need Zionism, and may even be weakened by it. Zionism is a surplus oppression. The excessiveness and gratuity of Trump’s declaration on Jerusalem, which so many people recognize, is only a reflection of the excessiveness and gratuity of Zionism itself, which too many people have for too long taken for granted. Dragging people from their homes and blowing them up is excessive, an atrocity too far. A partner whose addicted to such behavior will inevitably create trouble for the capitalist-imperialist family, which has enough problems of its own to deal with. It’s the U.S who insists, excessively, on including Zionism in a polyamorous arrangement, and who is, as can be expected in such cases, losing its mind over this misplaced affection, and endangering the core relationship. This is what the German FM and other members of the European Frist Wives’ Club see in Trump’s Jerusalem declaration. This is what a lot of people see in all the state-destroying, jihadi-chaos-creating aggression from Iraq to Syria and heading toward Iran—all of which makes no sense until you understand that the American project throughout has been an overcomplicated ménage-à-trois: capitalism-imperialism-Zionism. As Shoshana Bryen says: “The United States military, then, is a Zionist institution.” Bryen is herself a perfect example of the intimate relations between Israel and the American military, having made the rounds as former Director of the Jewish Institute for National Security Affairs (JINSA,, the prime meeting spot where Israelis entice senior American officers to see the world as Israel does), and as a lecturer at the National Defense University and the U.S. Army War College. The hope is that it’s all becoming too obvious and too much—an embarrassment of too many riches for Zionism. It’s why Hillary Clinton’s campaign decided not to highlight—except to donors—her passionate love for Israel: “We shouldn't have Israel at public events. Especially dem (Democratic) activists…. What about this as a base, and then she can drop in Israel when she's with donors.” While the donors and elite still swoon, the arc of the Democratic base is bending away from Zionism—and the Zionists know it. On the other hand, we have to recognize the persistent weaknesses of the Palestinians, who suffer constant, horrendous, human and material losses every day at the hands of a Zionist colonial machine. Israel, the Jewish State, has already established an apartheid regime, the late stage of colonialism, and has made clear that it is determined to extend that as far and as long as it can, with all necessary force. The illusion that America would do something to stop or reverse this has been finally shattered. Though it’s stance may be changing, thanks to the likes of Trump, and it is a medium- to long-term weak spot for Israel, the “international community” still grants Israel effective impunity. The Arab countries? Ha! Saudi Arabia, the Gulf monarchies, and Egypt will supply the rope and tie the knot. 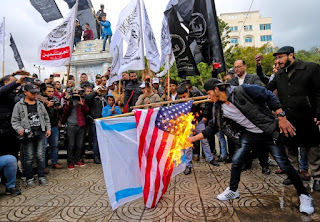 The staunchest Arab supporters of Palestine—Iraq, Libya, and Syria—just happen to be the countries ravaged by that United States military institution. A weakened Syria and (non-Arab) Iran may give some assistance, but really, nobody’s coming to save the Palestinians. External support in the way of boycott and sanctions will help also, but significant victories can only come from organized resistance by Palestinians themselves. The Palestinian political leadership which, as Noura Erakat says, “has abandoned confrontation with Israel as a matter of policy” would have to be changed. New leadership would have to emerge that renounces Oslo and forges a militant struggle for equal political and social rights, a multi-level strategy of resistance against colonialism and apartheid. This will be very tough, in a community that’s been ground down for decades by the Israeli-PA security apparatus, and the collaborationist mindset and economic interests that support it. To be thoroughly frank: though militant non-violent civilian resistance must be the core of struggle, it has to be backed by some kind of armed power. The ANC’s victorious fight against South African apartheid was not confined to “terrorist” Nelson Mandela’s prison cell; his comrades were busy outside. A movement to defeat colonialism and apartheid must demonstrate the capacity not only to take punishment but also to inflict it, to hurt the forces and institutions imposing Zionist oppression and to disrupt the normalcy of Zionist daily life. Everywhere, enemies of the IDF. No “well-being” respite. No justice, no peace. That is the only way victory over colonialism and apartheid ever has, or ever will be, won. Since the Zionists’ founding spasm of brutal ethnic cleansing—expelling over 700,000 Palestinian Arabs while killing thousands of others—and since colonialism fell into disgrace, Israel has been constrained to pursue further ethnic cleansing in a fitful series of measures, with levels of brutality adjusted for various international political and ideological exigencies. But it has not ceased to probe those limits. Israel is working very hard to compress political time and make it suddenly possible again to exterminate or expel enough Palestinians (we’re talking at least tens of thousands) to stabilize Israel for most of a century. That’s one of the things Israel’s, and its American patron’s, support of jihadi chaos in the region, as well as its attempt to foment war with Iran, is all about. The fat lady hasn’t sung, but the orchestra is in full swing. The Palestinians don’t have forever to stop the music. So, there’s no room for false hope or assumptions of inevitable victory. There’s an opportunity now for a successful fight to defeat Zionism, pitched precisely as a struggle against colonialism and apartheid, and it must be seized quickly. It is also not impossible for Zionism to defeat the Palestinians in some effectively irreversible way, as it keeps trying to do. It's just the case—the practical, utterly realistic political case—that nothing, not a thing, can be gained by trying to revive the zombie two-state peace process that has been killed over and over again by the U.S. and Israel themselves. To seal the deal, Donald Trump just drove a stake through its heart. There is no two-state solution. There is only one state: either the one colonial, apartheid state that’s coalescing now, or the one democratic state of equal rights that justice demands. For American left allies of Palestine, it’s time, past time, to clearly reject, not just the occupation of Jerusalem or the West Bank, but Zionism tout court. Back to the future it is. Liberal Zionists like to imagine ’48 is finished in some democratically acceptable way. Militant Zionists know they still have to finish ’48 as ruthlessly as possible. Principled anti-Zionists—that is, principled anti-colonialists—have to work very hard to make sure that ‘48 ends in failure, and that Israel never becomes the finished colonial project it wishes to be. This article incorporates parts of an earlier related post: Gaza Calling: It’s the Colonialism, Stupid!